If you are looking at adding some vibrant color to your garden, then New Guinea Impatiens could be the plant for you. 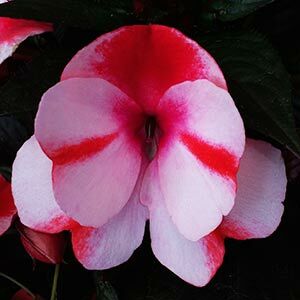 These sun loving plants are from New Guinea, the species is Impatiens hawkeri , and come in a range of flower colors from white through to deep red. Colorful and an excellent choice for a hanging basket if you you want flowers from spring right through summer. 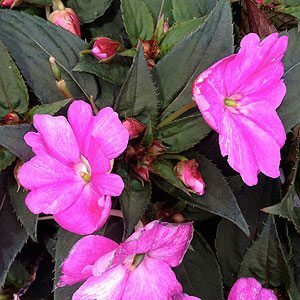 Commonly called the New Guinea Impatiens, they are heat tolerant, however we would still provide some shelter from the hot afternoon sun. Fast growing and fairly upright, pinch back to maintain shape and remove spent flowers. They are certainly a wonderful colourful group that have been hybridised to create some wonderful patio plants for full sun. The great thing is they also grow well in part or filtered shade. Over the past few years a number of very colorful cultivars have become available. A humus rich water retentive potting mix is best. Water in well with a liquid seaweed fertiliser, and then apply some general purpose slow release fertiliser. Little extra care is required for Impatiens hawkeri. These are a plant that love a humus rich fertile soil, they do like good drainage but also require good moisture, so a water retentive potting mix will help. Allow the the pots or hanging baskets to partially dry out between waterings. Although try are sun lovers they also cope well with the cold, but not frosts. Use a good quality potting mix and a regular application of slow release fertiliser , water in well when planting and stand back. Readily available from nurseries and hardware stores, look for plants early in the season to give them a good start. New releases and improved forms seem to be available each year.